Digital veteran Salon is still at the forefront of innovation. Earlier this year, the publication announced it would allow readers to give the site access to extra computer power to mine for the cryptocurrency Monero in exchange for an ad-free experience. Now, Salon is introducing a paid app and developing subscription service. Developed by Maz, the app, which costs $4.99 a month or $49.99 a year, offers exclusive content behind an ad-free pay wall on a mobile-optimized platform. Some existing content is going behind that paywall, including the popular “Life” stories, frequently deeply personal essays that have built a following of their own. Also available is a stable of exclusive video and audio content, including “Salon Talks” and “Salon Stage,” which feature interviews and performances from various people, including actors Nick Offerman and Patricia Clarkson and director Errol Morris, and a curated documentary series that will change monthly. Currently, the app offers 10 to 15 documentaries sourced from various festivals and production companies, both long- and short-form. 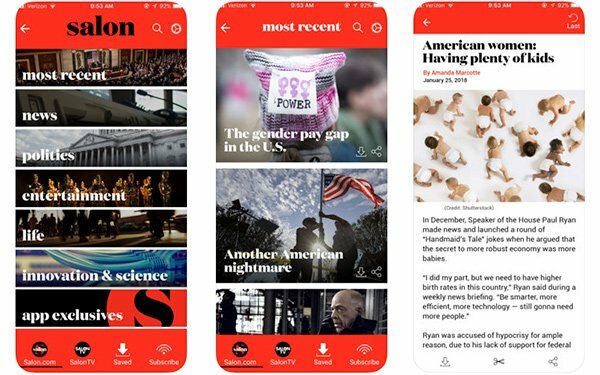 According to Jordan Hoffner, CEO, Salon Media Group, as the app gains more subscribers, Salon will invest in more exclusive long-form journalism and engaging video content. Hoffner adds that Salon tried out a subscription service nearly a decade ago (and had 75,000 subscribers), but decided to forego it in favor of an ad-based model. Today, the company is interested in diversifying its plans to meet users’ needs. Hoffner explains some readers don’t care about ads, others don’t want to see them at all. Some users are interested in the app as a way to easily navigate Salon’s content. To serve them all, Salon offers graduated levels of access. Available on Google Play and the Apple store, among other outlets, the app is accessible via Apple TV, Chromecast and Roku, in addition to mobile devices. The subscription service is expected to roll out over the next few months.